Alton Brown at last year's Edible Inevitable tour. 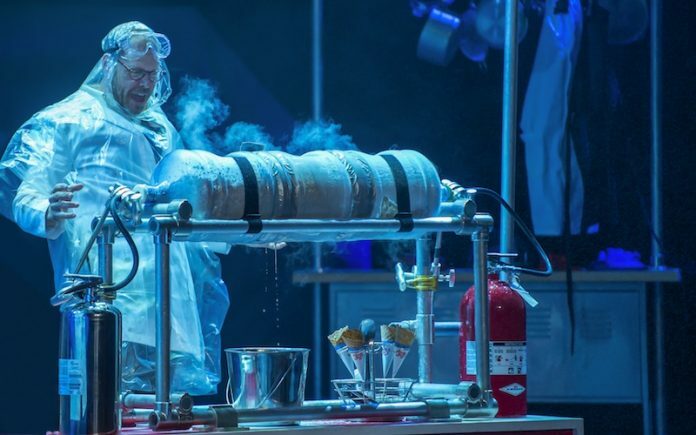 Brown has prepared all-new food experiments for his new tour, Eat Your Science. 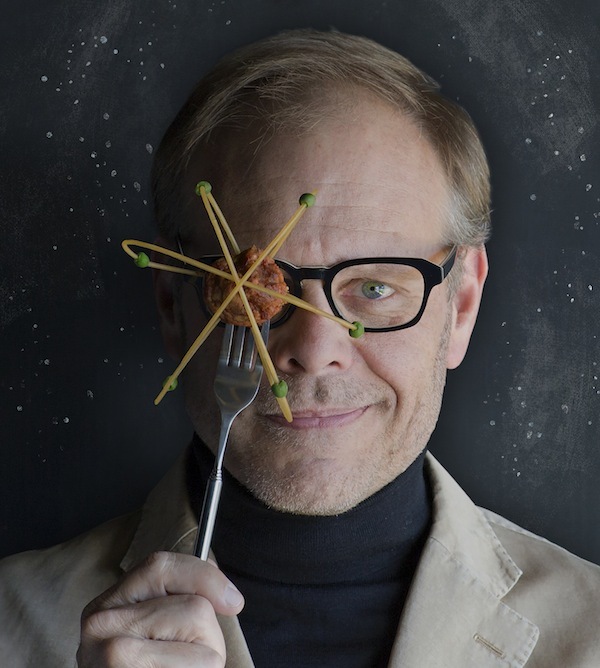 Food Network’s Alton Brown is coming to the Fox Theatre April 9 for his one-man culinary variety show, Eat Your Science. Brown, who got his start on the then-small cooking channel in 1999, drummed up a national following on Good Eats explaining cooking techniques on a molecular level (often using quirky sketches and even puppets). Brown’s spring show is his second nationwide tour, following last year’s successful, Edible Inevitable show. We spoke with Brown, who lives in Marietta, about his new show, how Food Network has changed, and that one time he got accosted by a fan at the urinal. How is Eat your Science going to differ from your Edible Inevitable Tour? It’ll be easier to say, for one thing. It follows the same model. With Edible Inevitable, what I was trying to do was set a model form, so to speak, for a culinary variety show. 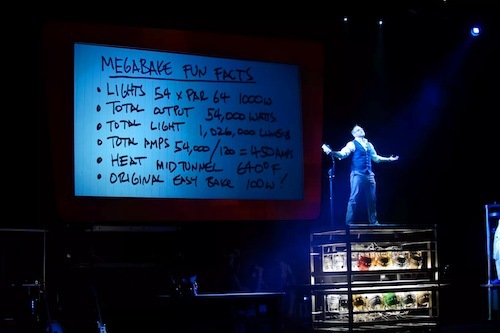 We did that show 114 times in 100 different cities, and I feel that the form was set. The show follows the same forms, except all of the material is brand new. There’s still puppets, live music, really big culinary demos, audience interaction, social media integration, video, stand-up—but it’s all new. You said that you’ll be doing things that you were never allowed to do on TV. Can I get any clues on what those might be? Let’s just put it this way. I’ll get to say thing that one would never get to say on television. I’ll get to perform—I mean, nobody at a television station is going to let me play a guitar and sing. Nobody in their right mind would let me do that. That would just be a really bad decision, but I get to do that. The food demonstrations we do are completely unreasonable and not something you’d be able to repeat at home, even with a lot of training or special equipment. You mention in the press release that there are going to be larger and more protective ponchos for people in the first few rows. Is the Fox Theatre cool with you slinging goo at the audience? I didn’t say anything about goo! Why are you bringing up goo? There is no goo. One-hundred percent no goo in the show. That doesn’t mean that [pause] they won’t need to sweep at the end. That’s all I’m going to say. But I will sweep myself after the show. In my mind, you’re a walking Encyclopedia for all things food and food science. Is there anything that you haven’t been able to wrap your head around? I still struggle with how vacuum tubes work. Ever try to explain vacuum tubes? It’s very difficult to explain what they do. That’s a tough one. I’m still completely befuddled by ramjet engines. They’re different from regular jet engines. What about in the food world? All of it? It’s all covered? Well here’s the thing. Food, in the end—there’s just not that much of it. Most food falls into certain classifications, and it’s mostly chemistry, and chemistry can almost always be explained by matter is changing and energy is being released and, in the end, electrons are moving around, from over here to over here. That’s kind of what cooking is in the end. You might not be able to figure out how to do something very easily, but explaining, getting one’s head around a concept, I think I’m okay there. The biggest thing for me right now is trying to understand the principles of food as they relate to food printers. Because that technology is really different, but in the end, if you’ve got the basics down, you’re going to be okay. Did you say food printers? Yes, 3D food printers. Where ya been, kid? This is new to me. This isn’t real. This is what’s wrong with your generation. You guys just don’t do your research. Yes, it’s a big thing. 3D food printers. Google it. Okay, I’m going to Google that. You should because you’re probably going to eat printed food in the next few years. You started at Food Network in 1999 with Good Eats. How have you seen the network and maybe even the audience change over the last 16 years? Well the two biggest changes—and I spend a fair amount of time thinking about this, especially during contract renegotiation years. One: Food Network went from being a niche network to a mainstream entertainment network. When that happens, it’s like the difference between feeding a swordfish and feeding a whale. When you become whale, you have to fish for very large schools of food, and so you program for lots and lots of eyeballs. The major trend of the last 20 years has been the competition show, specifically the reality competition show, my least favorite kind of entertainment, frankly. Food Network had to move heavily into competition to get those eyeballs. The second big change is how we consume media. When I started on Food Network, there was no social media. There was very little going on digitally. We use to put a thing at the end of each Good Eats episode that if you want the recipe from the day’s show, send us a self-addressed stamped envelope, and we’ll print them and give them to you. Ninety percent of the technology and platforms that people now consume most of their media did not exist when I started on television. That was a really good thing because I didn’t get any feedback from anybody. My fans couldn’t get a hold of me. I didn’t know if I was doing anything right or wrong so I just kept doing what I was doing. To this day, I try not to let my fans affect what I do because in the end, you have to be authentic. But aren’t you the host of Cutthroat Kitchen? I see Cutthroat Kitchen as different. To me, it’s an actual game show. Most reality competition, and in the food sphere this is certainly true, is simply you’re going to cook something, you’re going to jump through some hoops, and somebody is going to tell you if you’re going to be here next week. Cutthroat Kitchen is short art, very rarely do we worry from week to week. We do stunts where we might stretch a story arch over a period, but the biggest difference is that it’s a game and the game must be played in order for someone to win. There’s strategy, there’s the bidding on sabotages; it is actually a classic game show, more than an actual competition show as we’ve come to know them, in the days of Survivor and American Idol. Now, I did 3 seasons of Food Network Star. I did it the first season because it was a competition between my team and two other chef teams. I liked that. It was like being a coach of a sports team, but it was also very difficult to do. I won, but it was very hard. After two seasons, they changed the format, and I stopped because, quite frankly, I was bored. Do you think Food Network has made us more interested in cooking at home or just eating? I don’t know about other shows. We’re very aware and savvy as diners, but how much we know as cooks, I don’t know. I do think that we’re better cooks than we used to be, but we’ve also fallen into the trap of seeing cooking as a spectator sport, which changes our relationship to it. I wrestle with that all the time because I’m part of the media machine that has done that, and I’m very aware of that. I think that’s why I spend so much of my own time and money to make sure that other side of the coin is being played. Who in the food world intimidates you? Who makes you nervous? I get starstruck very easily. Even though I’ve met him multiples now, whenever I run into or do an event with Jacques Pépin, I’m humbled to be in his presence. I get that way around Anthony Bourdain because he’s so freaking talented. He’s one of the best writers out there, and his show is fantastic. José Andrés makes me feel that —nicest guy in the world and just a monster talent. I think there are people you respect because they manage to remain relevant for so long and then there are some people like Mozart who are geniuses, but they don’t even know it. And then there are just the lions of the industry, people who have changed the world with food. What’s the most uncomfortable you’ve ever been with a fan? Or maybe it’s with a chef? I use to do a show called the Next Iron Chef, which was a competition show where we were trying to find new people to become iron chefs. I always felt uncomfortable around anybody who didn’t win, who got sent home. I always feel uncomfortable going into their restaurants because I feel like they hold it against me, like I did that to them. I avoid those restaurants because I’m embarrassed. Fans are different. Fans can get really inappropriate. Fan who have been drinking can get even more inappropriate and sometimes that happens in a place where you can’t get away from. I had to deal with an intoxicated fan on a subway train in New York. I was accosted by a fan in an airport bathroom, which is just not an appropriate place to have to deal with that. At what point were you accosted in the bathroom? While I was at the urinal. Which just isn’t cool. 99.99% of my fans are incredibly respectful. And then you meet somebody who doesn’t realize that there’s an actual line, who doesn’t understand that you are in fact a person. Yes, I will pose for the picture with your daughter, but I don’t know if I want to get on the phone and have a conversation with your mom. No, I’m not going to make a home video with you. You have to setup the lines, and the truth is, celebrities who complain about being famous and complain about singing autographs aught not be famous. Those people are your fans. Those people are your customers. I consider it customer care, and I’m delighted to do those things, up to the point that I’m being taken advantage of or it’s just completely inappropriate, which very rarely happens. At least they didn’t try to make a home video with you at the urinal. When you’re actually in the act of peeing and somebody comes up behind you and starts to talk to you and you ask for a moment and they don’t stop, you have now crossed any line. The social contract has been broken, and if I just turn around and pee all over your leg, well, you know what, that was within my right to do so. That exact thing has happened one time in a whole bunch of years. You learn how to manage. Last question. Do you have any dream collaborators, people you’d love to work with on a project? Vince Gilligan, the creator of Breaking Bad. I’m a huge fan, and we’ve met a few times and are mutual admirers. I’d love to do something with Anthony Bourdain because he’s the brightest mind in the food business, certainly the food media business. I’d love to be in a Wes Anderson movie.